Alongside Signalbox, we use a content management system to create pages which are visible on the ‘front end’ or public facing website. 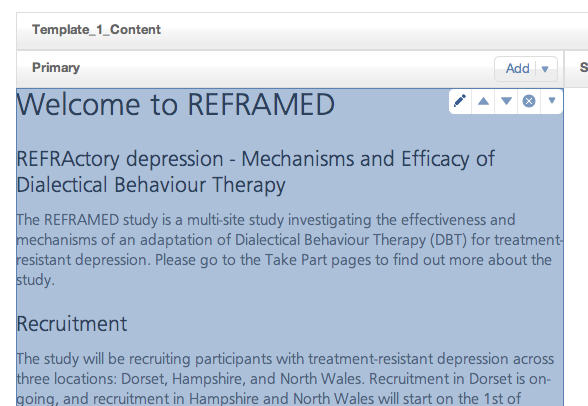 When adding content to the website, you can use markdown syntax to style content (see markdown for more details). Additional functionality has been added to the CMS app to enable some pages to be protected from public view. These pages are only accessible by the study team (i.e. researchers, research assistants, assessors, and clinicians). Scroll to the bottom of this page and click the ‘advanced settings link’. 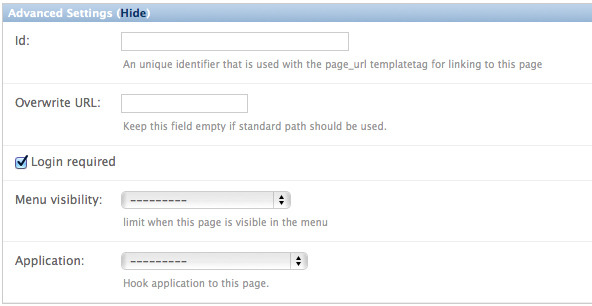 Then enable the ‘login required’ checkbox, and save the page. Protecting a page which has sub-pages (i.e. child pages which appear lower than it in the hierarchy of pages) will make all sub-pages protected. If in doubt CHECK! Logout of your account and make sure the page really is protected. Although protected from public view, the website is NOT to be used for sensitive content (e.g. correspondence, risk reports etc). This system can contain confidential and often very private data. Pick a strong password, and store it in a password locker. Auto generate a password here: http://rumkin.com/tools/password/diceware.php. The preferred solution is Keepass http://keepass.info/download.html. Markdown syntax is used extensively throughout the application to format text for display. Markdown is a simple format which allows headings, lists and links to be created without knowledge of HTML. For more information on markdown see: MarkdownSyntax. © Copyright 2012, Ben Whalley.